Binary fission is an asexual reproduction process that prokaryote organisms use to duplicate themselves. There is no exchange of genetic information between organisms during binary fission, so over time, populations can experience a lack of genetic diversity. To overcome this, one of the ways that prokaryotes like bacteria have developed to add genetic diversity to their DNA is conjugation. In this process, bacteria come into contact with each other by using hair-like structures called pili that are on the surface. Through a single pilus, one of the bacteria can transfer a DNA plasmid to the other. Two other methods that prokaryotes use to transfer DNA are transformation (they take up a fragment of DNA from the environment) and transduction (a piece of DNA is injected into the bacteria by a bacteriophage). The image above shows the process of binary fission. 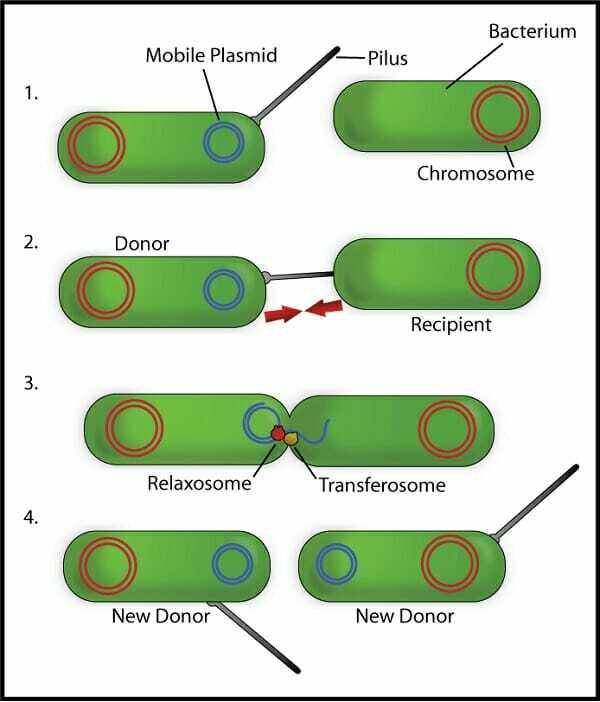 The image above shows how a bacterium uses a pilus to conjugate with another bacterium.